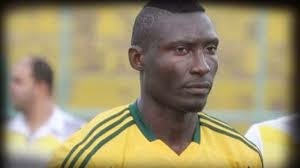 Cameroonian striker Albert Ebosse has died after being hit in the head by an object thrown from the stands during an Algerian league game, his club JS Kabylie have announced. The 24-year-old was fatally struck by a projectile at the end of JS Kabylie's meeting with USM Alger in Tizi Ouzou. A statement published on Kabylie's website on Saturday read: 'The Ministry of Interior and Local Government, speaking through minister Tayeb Belaiz, has given an instruction to open an investigation into the circumstances surrounding the death of Albert Ebosse. Ebosse had scored Kabylie's goal in a match that finished as a 2-1 home defeat to USM Alger. Reacting to the news of Ebosse's death, USM Alger published a statement on their own club website. It read: 'JS Kabylie's Cameroonian striker has lost his life after being hit in the head by something launched from the stands. 'This terrible news is saddening for football in our nation and in Cameroon and arrives like a bombshell just hours after the meeting with USM Alger which was played (on Saturday) in Tizi Ouzou. Ebosse played for Coton Sport FC, Unisport Bafang and Douala AC in his homeland before moving to Malaysian club Perak FA in 2012. He signed for JS Kabylie in July 2013.